Fun With Paper: Happy Birthday Kris! I have a friend who had a birthday a few days ago (March 20) and I sent her this card. She got it on time, but I forgot to post it here on time. Anyway it was fun to color on Kraft cardstock. This stamp is an oldie and probably retired by now. Aren't those little cupcakes floating in her drink adorable? I assume the drink is pink raspberry Crystal Light. Added some sequins and a sentiment and done! 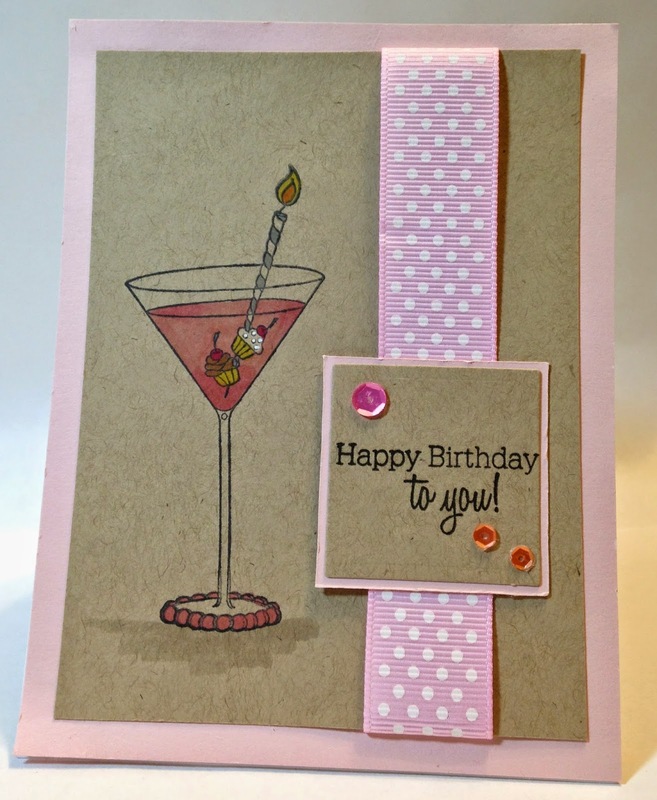 Love the little cupcakes floating around in the Martini! I've stamped on Kraft paper but never colored on Kraft paper. Great card! That stamp is just the cutest little thing. What brand is it? There is always EBay to find stamps. Super card, Sheri! I'm sure Kris LOVED it! I, too, love the coloring on kraft cardstock - such a great effect. Thank you SO much for your hospitality - I had a wonderful few days with you! Spring Means Going to the Playground!